I hope you enjoy these lovely photos of the Aqualillies, Kelly Golightly, and me. The talented Fred Moser snapped these shots at ACME House Company's Atomic Hummingbird in Palm Springs. Read on the next time you need a little pick me up! 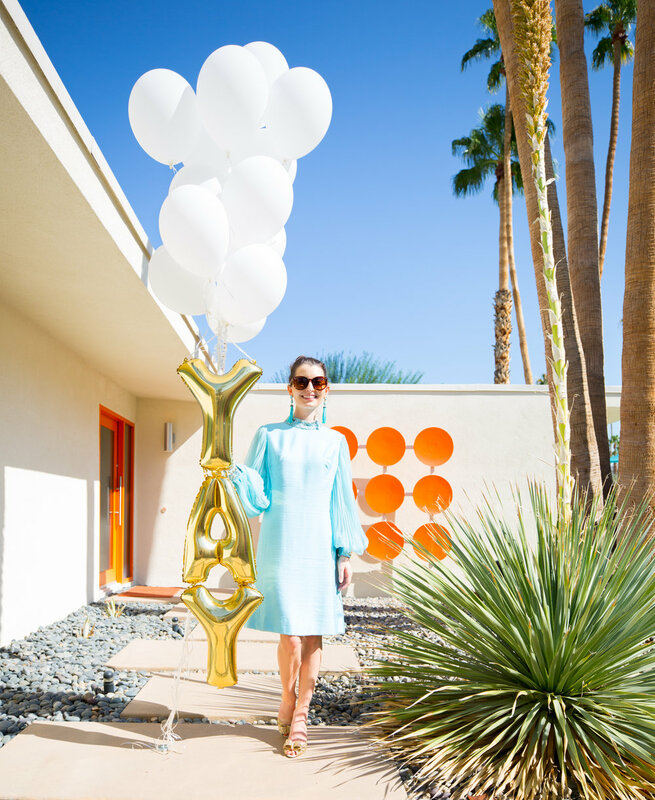 I’ve been following Kelly’s inspirational blog for awhile and we finally met at Modernism Week in Palm Springs. She continues to inspire me as she frequently gets real about the “a” word on her blog and Instagram. Yep- anxiety! You know, that thing that STILL has a stigma around it that brings feelings of inadequacy or shame to my mind when I admit out loud that I struggle with it. By sharing her story, Kelly has made me want to share a little more of the reality behind my happy and colorful Instagram account. Guess what? You can be a really positive and overall happy person but really have a tough time shutting off/finding motivation to get going. No matter where you are with your mental health, couldn’t we all use a little more happiness? We have to remember the good wouldn’t be quite as good if there weren’t some struggles along the way, but we hope this inspires you to find a little more happy to help you get through your own clouds. There is always another rainbow around the corner, and don’t forget that you just might be the rainbow someone else is looking for! Thank you to the talented Aqualillies synchronized swimmers for literally being our rainbow at my Palm Springs rental house. By now we all know not to put too much stock in material possessions, but with the world of the internet we can be constantly bombarded with reminders that we don’t have as much as our Instafriends. It’s so much more fun to focus on what you HAVE instead of what you don’t, right?! Finding happy little things to surround myself with helps me stay in my lane and be grateful for what I do have. Sometimes this means picking up a fun new trinket from the dollar spot at Target. Sometimes this means dressing in a happy color like hot pink or yellow, even when I’m feeling a little blue. Other times it’s lighting a candle and just enjoying that scent for a few minutes. Want to know something we all have in our budget that can evoke a lot of extra happiness? Balloons! I dare you to go by a small hot pink latex balloon (~$1.25) and then NOT see someone around you smile. 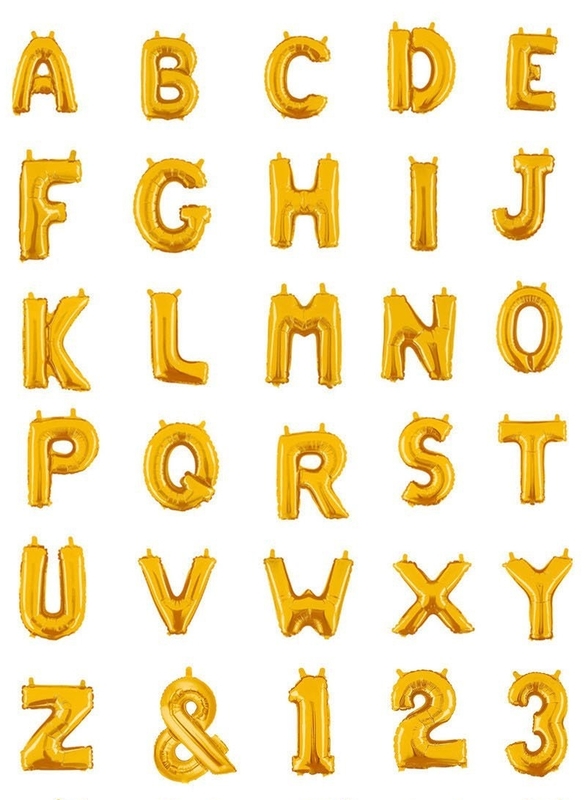 Or, keep an eye on our balloon shop’s Instagram for some of our favorite finds. Mix the ingredients in a cocktail shaker with 2-3 ice cubes. 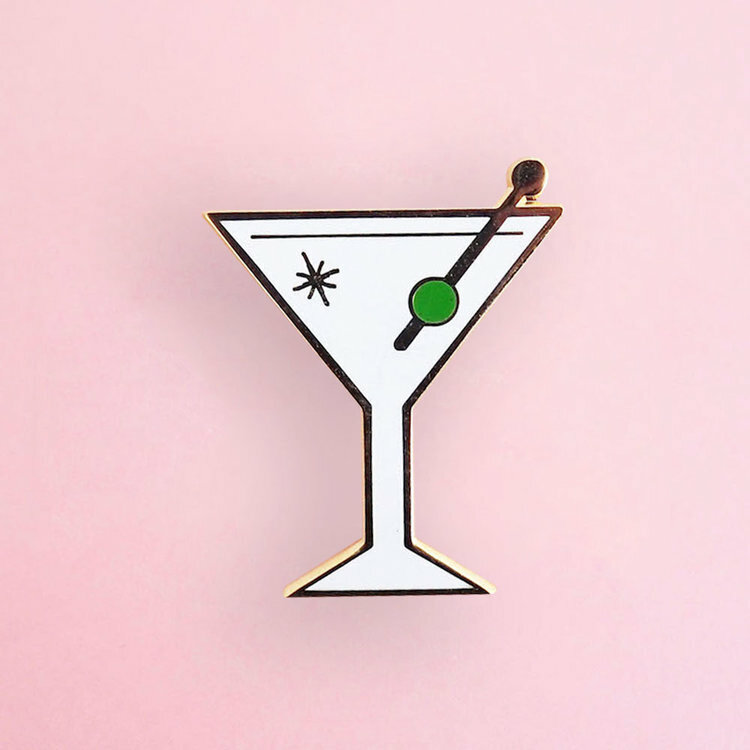 Pour into a frozen martini glass and serve with a stick of 2 green olives. 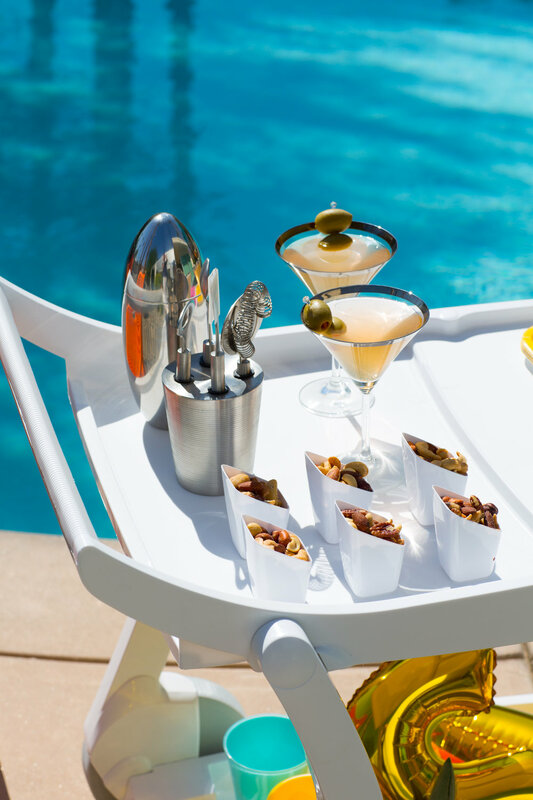 Throw that on a cute bar cart and voila! Even a simple mini fete is plenty good enough and will help you recharge. Or, going for a walk with someone or even giving them a call can make a huge difference. When I feel mopey and the last thing I want to do is talk to anyone, but sometimes I try really hard to do it anyway. More times than not I hang up the phone feeling ready to get going! We can’t always be traveling all the time, but I sure do try! There is nothing that energizes, excites, and inspires me quite like being in another city. It doesn’t even have to be anywhere fancy, just seeing a new place brings me a sense of adventure. Palm Springs is the créme de la créme when it comes to giving me an instant dose of happy. The palm trees, pools, and midcentury modern homes get me so inspired. Well, I sadly can’t be hopping on a plane there every week, so when I don’t have a fun trip lined up I try to be a tourist in my own town. Kelly & her husband/photographer “Fred baby” are great about this; they often drive around to look at the local architecture and photograph homes in nearby neighborhoods. Tourist-ing is really just about looking at new things. Take a walk on a street you’ve never walked end to end, a bike ride to a local coffee shop, or drive to the next town over. Notice all of things you’ll see that you haven’t appreciated before! Anxiety and depression are very real, and sometimes it takes more than a few tips you find on the internet to get your mind where you want it. The worst thing we can all do is just continue to keep quiet about mental health, so let’s start talking! Talk to your loved ones, a mental health professional, or even to your social media friends about your struggles and also what makes you happy. You never know who is needing a little extra dose of happy, so try to be someone’s rainbow today. In the words of Miley & Dolly, “We are rainbows me and you, every color every hue. Let’s shine on through.” Cheers to making our own Rainbowland! Thank you so much for shopping through my affiliate links, which earn me a small commission! Getting to have this blog be part of my job is part of what keeps me going, so thank you for your support! Follow along on Instagram and say hi in the comments below. Click here to see more images of the Atomic Hummingbird where we stayed!